Articles Glossary What is 5G? This article is an overview and includes links to a series of detailed articles describing 5G wireless features, supporting infrastructures and related emerging technologies. The convergence of new technologies and products is creating a quantum leap forward in transforming industries and world economies, profoundly affecting everyone. Technologies like robotics, artificial intelligence, self-driving cars, and smart homes and cities will have a massive impact on everyone’s lives. 5G is the lead technology enabling these transformations. 4G wireless networks enabled the mobile phone to evolve from a telephone to a small full-featured network computer. This has created numerous benefits like email, video streaming, and thousands of smartphone apps. 4G performance limitations and the limit on the number of devices that could be connected have kept the cost of each connected device relatively high. The next cellular evolution, 5G, has design specifications that overcome many 4G limitations. 5G is also designed to support future technology innovations. It can support millions of devices connected continuously to a high performing mobile network with 100 percent reliably, at a greatly-reduced cost. 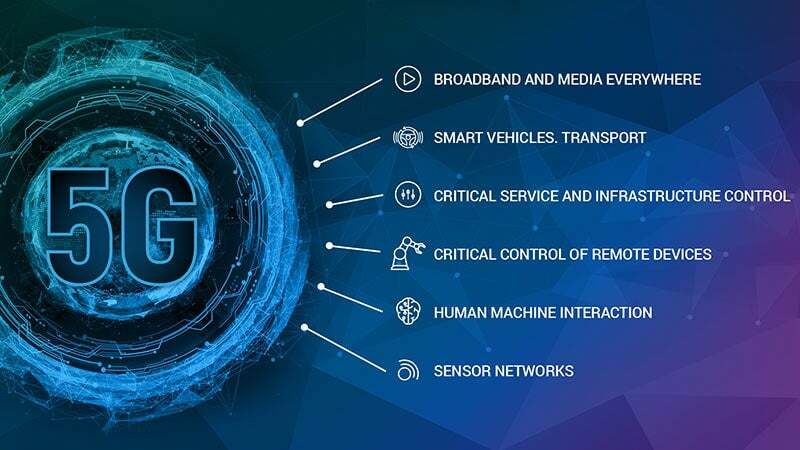 5G enables a group of existing and emerging technologies and the combination of 5G and interconnected technologies working together create a value greater than the sum of individual components. Blockchain is rapidly becoming the secure communications, ledger and storage technology. IoT is merging with Blockchain as BIoT. Blockchain is a network-based technology that helps make the phrase “the network is the computer” become a reality. MEC and Cloud Edge – Cloud computing is moving ever closer to the network edge, which means in closer proximity to the end users and machines. Many applications and services are becoming more sensitive to network latency. Moving computing resources closer to the end user reduces this latency. AI/ML – Artificial intelligence and machine learning are bleeding-edge technologies, and when used in conjunction with a fast always-connected 5G network, they bring new capabilities including inter-machine data-sharing and decision-making. Advanced End-User Equipment – New user devices are emerging, and market experts believe that every person will have up to eight wearable smart devices in the near future. This includes augmented reality systems, wrist computers, each with advanced artificial intelligence, and connected to the 5G network. Autonomous Machines – Self-driving planes, trains and automobiles are being tested today. Autonomous drones are already available, and robotics continue to advance. These technologies have network requirements that are addressed 5G design requirements, making the ubiquity of these technologies possible. With the emerging technologies combined with the 5G network capability to attach billions of users and machines to the internet, the world will truly be connected. New markets will be created, and how people interact with technology will drastically change. The internet has already had this effect on the way we communicate, and 5G is leading the next technology revolution. The 5G specifications define a set of requirements including network performance and security parameters, the minimum number of device connections and overall energy requirements. 5G design requirements also specify a guarantee of nearly 100 percent uptime and ultra-consistent network services. Self-driving cars and trucks, health services, traffic orchestration, energy power-grid management and others that directly impact public safety rely on the integrity of 5G networks. The diagram below shows the 4G LTE performance compared to 5G. 5G is the access network in the overall architecture. A very simplistic view is diagrammed below. 5G connects client devices with the edge of the mobile carrier network. Things – The term “things” represents computing clients accessing the network. Things are either human-operated end-user clients or Internet of Things (IoT) autonomous network-attached devices. Edge – Edge represents the Cloud Edge Computing systems (Cloudlet), or a Multi-access Edge Computing (MEC) system. These systems are located near the mobile carrier’s 5G antenna. Co-locating the computing facility with the wireless antennas provides closer proximity to the end users. Network services are emerging that require extremely low network latency. The closer the cloud services are to the end user, the lower the network latency. Smart road and autonomous vehicle orchestration systems are examples requiring low latency. Self-driving cars communicate with other cars, often through the new 5G network infrastructure. These systems require real-time driving decisions and cannot withstand the latency resulting from remotely-located cloud systems. Cloud – The cloud function here represents any central datacenter, web application or public cloud service which is accessed over the internet (or potentially over a private WAN connection). Mobile network carriers will be required to upgrade core network infrastructures to a new generation of technologies that support 5G technology and business requirements. 5G wireless technology enables new mobile or stationary network-edge clients. End-user clients including mobile phones, tablets, laptop computers, gaming systems, automobiles and other computing systems with human interfaces. Machine clients IoT is one of the main drivers of new network-connected devices. 5G technology has been designed to require a minimum hardware footprint and low power for the massive amount of new small IoT sensor devices that will use one of several IoT telemetry network protocols. A more detailed article on IoT telemetry technologies is here. 5G Radio Access Network is the latest evolution in the mobile carrier cellular infrastructure. The RAN infrastructure includes base stations, base-station interconnection networking and mobile carrier core technologies. RAN technologies are covered in more detail in later sections. Mobile carrier infrastructures have unique technologies to support the carrier network.This includes 5G core technologies to process and manage wireless radio data at the base-band unit (BBU), as well as a broad set of functions including carrier business systems and subscriber management, wireless routing management, networking and security systems and various network manage orchestration systems (5G packet core). Multi-Access Cloud Edge (originally Mobile Edge Computing) is a physical cloud datacenter co-location facility deployed near radio towers. These co-location facilities are directly connected to the mobile network Radio Access Networks, which are located close to the end customers. Cloud service providers with latency-sensitive application services can provide high-performance, low-latency by hosting application services in close proximity to end customers. Deployment plans currently exist for tens of thousands of these cloud-edge co-location facilities.